If you're looking to build an "All Out" BIG Big Block Chevy up to 763ci for competition then take a look at all the features the Dart Race Series Blocks offer. 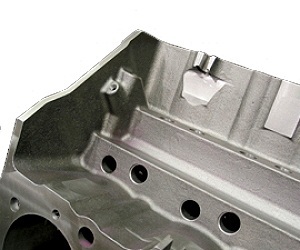 These Cast Iron blocks have all the ingredients that max hp large cubic inch engines need - such as raised .600 cam, .750" wider pan rails for BIG stroke cranks and up to 11.1" Deck Heights. All OE bolt holes for starter, clutch ball, etc. 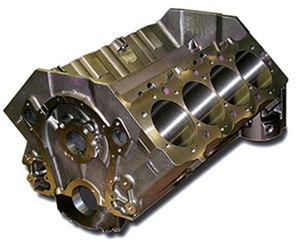 Also available as a ready to assemble package from Lukovich Racing Engines with finish honing, with complete or partial rotating assembly, or in assembled short block and long block combinations. Bore Spacing: 4.840" & 4.900"
Cam bearing bore ID: 2.250"
Cam Bearing O.S. : +.010", +.020", +.030"
Cylinder Wall Thickness: .300" min at 4.700"
Deck Height: 10.200", 10.600" and 11.100"
Main Bearing Bore: 2.937" - 2.938"
Main Cap Press: .005" - .005." Oil Galley, Main: Stepped , 9/16" - 1/2" - 7/16"
Oil System: Wet or Dry Sump - Main Priority Oiling Oil Galley, main: Stepped, 9/16" - 1/2" - 7/16" Oil Galley, filter main: 5/8"
Rear Main Thrust Width: 1.622"- 1.624"